The old saying "if you don't succeed, try again" must have been the mantra at developer Pseudo Interactive this past year. 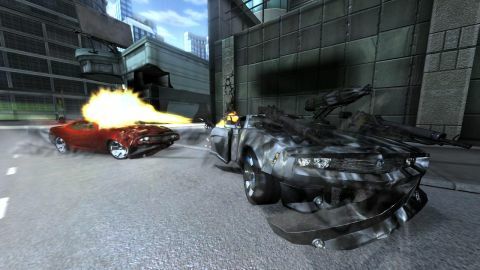 Heeding the feedback from the first Full Auto on Xbox 360, the PS3-exclusive follow-up has improved on its predecessor in every single ridiculously destructive way. An eviscerating visual cacophony, it sports a much wider array of weapons, vehicles, and - most importantly - mission variety. Played at a pace that just about borders on 'Ludicrous Speed', it's a feast for the senses as you tear through Meridian City's districts with a pin-your-ears-back-and-let-the-bullets-fly attitude. The most obvious improvements are the new, arena-style gladiatorial matches that involve pure destruction - blast, smash, and dash. Sure, there are still plenty of old-fashioned races that'll have you focusing on finishing first, but you'll still get to annihilate your enemies, the racetrack and city in general. No matter what the event, Battlelines will rekindle your love affair with fiery explosions. A surprisingly broad array of carnage-inducing tools are at your disposal, from good old machine guns and rear-end grenade launchers to napalm, lasers and mortars. The smokescreen actually functions pretty well this time around, too, causing the poor sap trailing you to be engulfed in a black, oily cloud that'll virtually blind them for a few moments. Wouldn't you love to do that to all tailgaters? Description This built-from-the-ground-up PSP racer hopes to become the title you go to for all your car racing and wrecking needs, at home or on the go.